WKDD is known for welcoming music from the 90s, 2k, and today, but on Saturday, July 23rd it also welcomed its good friend Smiley. At the largest outdoor kids’ event in northeast Ohio, WKDD Kidz Day, Smiley met up with several families who were enjoying all of the fun kids’ activities such as mini golf, crafts, moon bounces, a petting zoo, spinning rides, and music. Smiley even found his kangaroo pals Kenny from Kennywood and Zippy from the University of Akron to share some fun with. The Cookie Cruiser was also a hit, allowing guests to show off their artistic abilities through cookie decorating or enjoy a tasty original Smiley Cookie. Even in the heat, Smiley and his friends had a terrific day and would like to thank everyone for making it a memorable trip to Green, Ohio. They’re not just for kids anymore! Due to popular demand, what started as a special freebie for kids has now become a tasty treat not just for the young, but the young at heart. Sounds like a familiar story, right? Well it is – after all, that’s exactly what happened with our Original Smiley Cookie. We just couldn’t bear to withhold Smiley Cookies from fans of ALL ages. Everybody needs a smile! We first introduced our Mini Smiley Cookies last year as an alternative for kids. Now, they’re available for ANYONE to purchase, at just $5.99 per dozen. Just about everything is cuter in mini-size, and Mini Smiley Cookies are no exception. These diminutive treats weigh in at less than 100 calories each – big taste, no guilt! These babies are perfect for birthday parties, an office snack, and of course, summer picnics. Just like our originals, Mini Smileys can be customized in the colors of your choice, to suit any occasion. Your Little League team will be thrilled to chomp down on a couple dozen Minis in the team’s colors. Heading to a graduation party? Bring a dozen in your grad’s school colors. Just give our bakers a couple days notice, and they’ll have your special order ready to go – no additional charge! Click here to get the phone number for the Eat’n Park nearest you. They’re mini cookies…guaranteed to create BIG smiles! Who doesn’t love cupcakes? I’m not sure, but I do know that Smiley DOES love cupcakes. 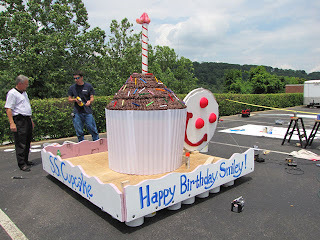 So to celebrate his 25th birthday, it only seemed fitting that we would build a giant cupcake and take it sailing on the strong waters of the Allegheny River… makes sense, right? Under the careful supervision of trained adults (not really), we dusted off our power tools and hammers to build the second generation Eat’n Park float for the Pittsburgh Regatta’s "Anything that Floats" contest on July 3rd. It featured the biggest cupcake I’ve ever seen, as well as a larger-than-life Smiley Cookie…all atop a foundation of Smiley icing buckets. After a day of hard work, lots of sweat, and only a few tears, the S. S. Cupcake was ready to set sail! Ready to hit the water at the Point in Pittsburgh. Now, you must be wondering if it did, in fact, float. Well my curious cookie-loving friend, IT DID! Thanks to the strength and endurance of my fellow crew members, we successfully floated from PNC Park to Heinz Field. Not only were we the third place finishers, but we were also awarded with a trophy for being the Best Decorated Float! My arms are still a little tired, and I should have used more sunscreen, but at least this cupcake didn’t crumble! with the Pittsburgh skyline in the background. We're already looking forward to next year. One of these times, we're going to win this race. If you have any great ideas for next year's theme, post them here! If you recall my last posting, Spring Farm Tour 2011, you’ll remember that I was wishing away the endless rain that fell almost daily during spring. Well, the rain has finally stopped, and the farmers have been hard at work. Those soggy days of April and May have passed, and they’ve been replaced with fields of veggies. It’s quite amazing to see the transformation. I really felt the rain was going to slow down the start of local produce. Boy, was I wrong. On June 30, I visited with Dan, Lynette and their son Joey at Yarnick’s Farm in Indiana, PA. The Yarnicks are some of the nicest folks you every wanted to meet, and they’re not bad farmers either. I arrived at the farm and was greeted by Dan. He took me up to their home where Lynette was busy preparing breakfast. We had eggs, hand-formed sausage patties, and potatoes with hot peppers and assorted tomatoes. If Lynette ever decides to open her own restaurant, we’ll cross our fingers that it won’t be anywhere near Eat’n Park! The Yarnicks’ farm is one of the most advanced and innovative farms that I’ve visited. They’ve instituted some very creative farming techniques that delivery high quality and great tasting vegetables. In fact, these high-tech farming methods allow the farm to have vine-ripened tomatoes 10 months out of the year and the earliest, freshest, sweetest corn a full month before other area farms. Believe it or not, that’s me eating fresh corn in the field in the photo below. The old corn standard, “knee-high by the Fourth of July” certainly doesn’t apply here! Local sweet corn - before July! During an earlier visit back in May, Dan gave me a sneak peak at some of the innovations his family uses to deliver such early crops. One of these innovations was the use of plastic blankets, which keep the plants and ground free from frost. Of course, this isn’t cheap, but it allows the Yarnicks to get 2 and sometime 3 crops planted and harvested in one growing season. I know what you’re REALLY wondering: How on earth do they get ten months of vine-ripened tomatoes in Pennsylvania’s climate?? Well, let me explain. Not only do the Yarnicks grow crops in their fields, but they also have an extensive and elaborate system of greenhouses. In mid-February, the Yarnicks start many of their crops in these greenhouses, then later transplant them to the field. In addition, to get some of those early veggies, Dan grows some crops hydroponically. Hydroponic means that they are grown without soil in a nutrient-rich water solution in a controlled environment. While the Yarnicks also grow tomatoes in their fields, the addition of hydroponic growing allows them to plant and harvest tomatoes for a much longer period of time. This is truly a competitive advantage that separates the Yarnicks from other local farmers. Those tomatoes are looking good! Right now, they’re only growing enough of these tasty tomatoes to supply their own farm market, which is located on site at the farm. However, thanks to the Yarnicks’ innovation, they’re able to supply Eat’n Park restaurants with local cabbage, zucchini, and yellow squash before July. We’re fortunate to be working with the Yarnicks, and I’m looking forward to seeing what new farming techniques they’ll try next! If you’d like to read more about the Yarnicks, or perhaps visit their farm market, click here. In honor of Smiley's 25th birthday this summer, we asked our email club members to share their favorite Smiley memories. Here are a couple of the responses we received. Enjoy! "I know you are wondering what Smiley cookies have to do with Florida, so let me tell you our story. We moved to Florida in January of 1988 from Butler - obviously, we went to the Butler Eat'n Park at that time. Our oldest daughter was born in 1982 before Smiley was born, and our youngest daughter was born in 1987, just after Smiley came along. But our oldest daughter got to enjoy Smileys on each visit to the Butler Eat'n Park for the two years that Smiley was around. It was a real treat. Our youngest had not yet tasted her first Smiley because we moved to Florida. Fast forward to today. Because my husband and I are Pittsburghers at heart, born and raised, on every trip back home, Smiley's were a must - not just for consuming during our visit, but also to bring home with us. If the whole family was not going to Pittsburgh, then the person travelling better not come home without the Smiley Cookies, or else!!! We have enjoyed them for years, and when we come back to Pittsburgh now, we stay with our nieces and get our Smileys at Bethel Park or Penn Hills. For the Super Bowl in February 2011 against the Packers, the mini Steeler Black & Gold Smileys got shared with our church choir. One of our choir members is from Wisconsin, so she brought cheese curds to support her Packer team. The cheese curds were tasty, but cheese curds don't smile! Even though our team was unable to bring home #7 this year at least our Pittsburgh Smileys brought smiles to all of my choir friends. Basically, we love our Smileys and generations of our family and extended family hope to keep enjoying them for another fifty years. We'll either come get them up your way, or order them online. Personally, we love coming home to our roots and selecting our own Smileys. So to all at Eat'n Park who create these wonderful memories, Keep on Smiling! Thanks to those wonderful Smiley cookies, we'll keep smiling! I'm sure #7 isn't far off. Go Black & Gold!!! We luv yinz guys!!" "First off HAPPY 25th!!! It's hard to believe it's been that long. : ) My daughter who just turned 30 this year has loved the cookies from day one. Who of us hasn't snuck a bite of our kids cookie just to make sure they were ok for them to eat (wink wink - we just wanted a taste of our own when it came to the table). We have taken these cookies far and wide, on vacations and to celebrate graduations, including eating them after the March of Dimes walks (thanks again for the support) and other events."